There are few things that say “Christmas” quite like holiday cookies. 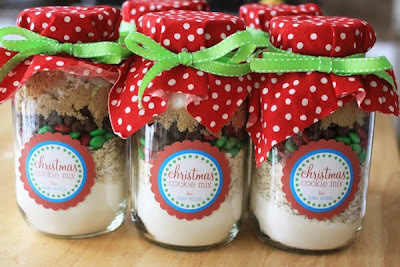 If you want to give a gift from the heart this year that helps express the excitement of the holiday season, creating Christmas cookies in a jar is the perfect way to share your enthusiasm for the spirit of the season. They’re easy to create, aesthetically pleasing, and one of the most useful gifts you could offer this year. Before you can even begin to select the right jar to meet your needs or purchase the ingredients from the grocery store, the first thing you have to do is choose a recipe that you like. It may help to actually bake a few of the cookies on your own to decide which one is your personal favorite. Unfortunately, there are many to choose from. Whether you want to go with the traditional “emergency cookies’ packed with quick oats, cranberries, and white chocolate chips or you’d prefer something a bit more exciting like M & M cookies or you even want to go with something completely different like Christmas Crunch cookies, the key here is to choose a recipe that gives you a chance to create beautiful layers inside the jar, so you’ll want a variety of different ingredients to help build that amazing look. 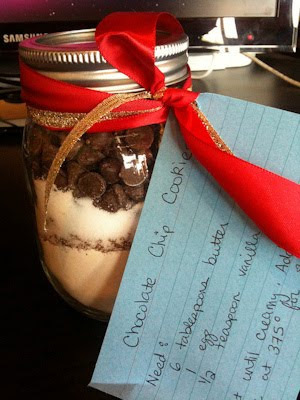 One of my favorite recipes is Cowgirl cookies because they look beautiful layered in a jar. You can find the recipe at The Larson Lingo along with a free printable label like the ones shown in the photo below. Every recipe is going to require a different sized jar, and if you’ve never done this before, you may have a bit of trial and error on your hands. I've found that the best choice is to use a quart-sized Mason jar, as that’s the most traditional option here. You can pick them up at a local craft store like Michaels. In some cases, though, you may have to go smaller or larger depending a bit on which recipe you choose. If you’re planning in advance, you can keep your costs down by purchasing your Mason jars at the right time of year. In the late fall, well after summer gardening season has ended, stores often put their canning supplies on sale, like their complete stock of Mason jars, helping you save quite a bit on your holiday gift budget. You can also often pick up vintage Mason jars for less than you would imagine at antique and thrift stores. To complete this step, you may want to have a wide-lid jar or a funnel large enough for each of your ingredients to go through. It helps to make the layering process easier. Add each of your ingredients to the jar, one by one, pressing each layer down with the back of a spoon. If you want to get really creative, when you’re finished, take a skewer or a knife and press it down the sides of the jar, like you might with a child’s sand art project, to create beautiful patterns in the layers. Once it’s filled, add to your jar a bit. Choose a pretty holiday fabric to put on top as well as a matching ribbon. Put stickers on the jar or paint it. Get creative with whatever you think will look best, because it will make the gift look a bit more attractive in the end. 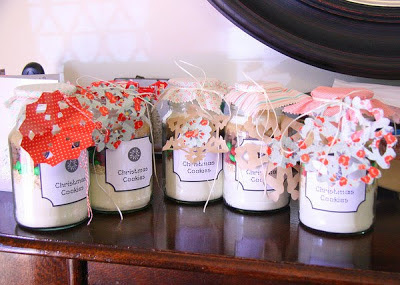 They can’t create your amazing cookies if you don’t add the recipe, so copy it onto an index card or some matching scrap booking paper, punch a hole in the corner, and add it to the jar with a bit of beautiful ribbon. Or print out the free stickers with directions from the Cowgirl cookie example shown below. In either case, you'll have a beautiful handmade holiday gift for friends and family.